Do you want to have a perfect nuptial with the most appropriate wedding dress in your favorite venue? We wear suitable dress in certain venue, let alone the most important day. Some married beauties said that their grand ball grown did not affect the imaginary results; however, we strongly suggest that you choose the most suitable wedding dress that coordinates the dreamy wedding venue. You will find that is really yours. How to choose the best and the most appropriate types of wedding dress in different venues, such as church, ballroom, beach, garden or yacht? Please remind the tips as follows. Since the venue is especially dignified, the wedding dress needs to be conservative. Sleeveless dress or sweetheart wedding dress is not so adaptable. Your shoulders may have to be covered, so look for a dress with sleeves. Also, dropped wedding dress may strengthen the feel of elegance. In ballroom, ball gown, mermaid and A-line wedding dresses with ornate accessories are encouraged. Whether you want to be a queen or a princess on the wedding day, you will find a way to fulfill your dream with these wedding dresses. In addition, for fabric, charmeuse, taffeta and chiffon materials are suggested. Simple and comfortable dress like tea length dress suits the beach wedding most. A bride shared her experience "tea length dress is a perfect dress for a casual wedding outdoors and its super comfortable." 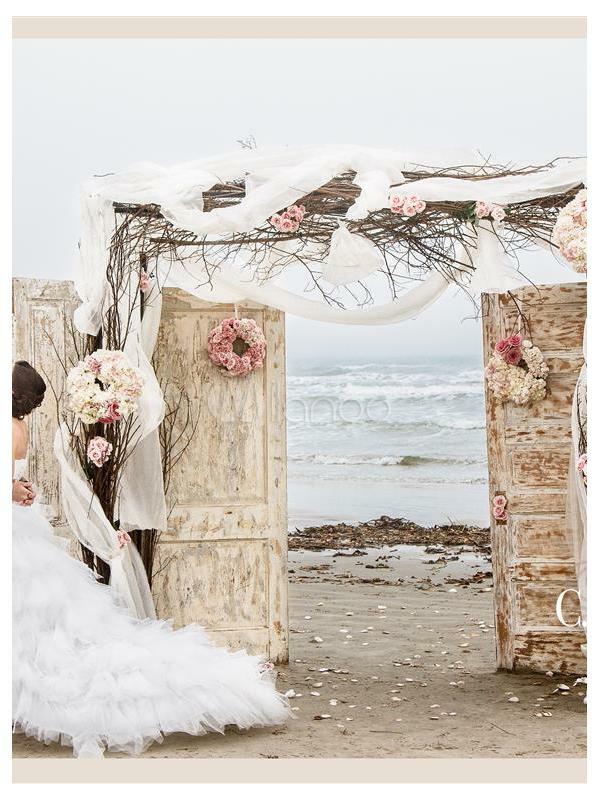 Do not miss the attractive moment that the breeze whisks your beautiful hair and wedding dress near the ocean which makes you process natural and lovely grace. Thus, you'd better choose light fabric like tulle or chiffon. The sweetheart neck creates a preppy and dynamic feel which matches the rural feel. But considering the uncertain weather, we suggest a dress with a removable shrug or wrap. And the airy fabric will make you feel comfortable. For garden wedding, simple decorations and a bit of bright color embellished on the dress will coordinate with the circumstance. For barn wedding, If you like vintage look or country feel, lace or cotton will certainly help you. You should bear in mind, do not overly decorate, simple and natural dress is the key. This is different from the beach wedding, it is more formal since it has club house in the yacht, and considering the strong sea wind, mermaid or sheath is the best choice. It is not only elegant but also billowy enough to face any sea breezes. Both Taffeta and Lace are suitable. In a word, the perfect wedding dress ought to match the wedding venue, also, it should suit your body frame, face shape and hair style, etc. How to choose the perfect wedding venue? First, discuss and decide how large the reception will be and how many guests are you going to invite, this is a key in venue selection. Second, evaluate how much you want to spend. Third, make a list of possible plans and choose the most appropriate one that suits most of your needs. Thinking about what the venue can supply for you; for example, dance floor, park, a kitchen for heating food, etc. Fourth, go to see the venue and check all aspects of the planning details and finally decide the site. If you want something special, forest or winery may be a new choice, and they are incredibly beautiful. Various wedding dresses introduce and guided for brides in this video. This video will teach you to find out the style of wedding dress belongs to you. Ashton Gardens is the most unique wedding ceremony and reception destination. This video suggests some ideas for planning garden wedding. Q：I like ball gown so much, but I found it didn’t suit my wedding venue which is in a garden, how to fix this thing? A：You may add some elegant wedding centerpieces that will definitely match your wedding gown. Thus, everything will instantly become sophisticated, glamorous and elegant. Or you may book a hotel for your wedding reception, then you can dress two wedding dresses, one is casual and comfortable dress in garden wedding ceremony, the other is your favorite ball gown in the grand hotel for reception. Q：My wedding day is in August, it’s too hot so that I ‘m wondering weather should I wear a wedding dress or a beautiful white holter dress instead? A：I suggest that you could choose light and airy wedding dress on your big day, forget the sophisticated and thick material or the mermaid style, A-line wedding dress made of chiffon is suggested. Also, don’t worry the hot day, there will be air-conditioned or breezes outdoor. The most important thing is to make you yourself feels confident and satisfied with the dress you ever dreamed or imagined.